Yes, it’s that time of year again when I bang on about applying for membership of the RE, a.k.a the Royal Society of Painter Printmakers . 1: Keep things simple. You only have one chance to impress and now is not the time to show how versatile you are. I know it’s tempting to put in examples of all the different aspects of your work but you only have one chance to impress. Random pieces that do not relate to the main body of work are pointless – try to keep the look fairly uniform. 2: Presentation. All applicants are expected to be professional and it’s very important that the work is presented to the highest standards. It goes without saying that all the work should be clean – no crooked mounts, no dirty or creased margins. If you don’t think your work is worth presenting properly, then there’s no reason to think anyone else will. 3: Supporting work. Make sure it is relevant – don’t put in life drawings to support urban scenes, as I once did. You want to reinforce the thinking behind the work and hopefully increase the appreciation of it. If you don’t use sketchbooks, then try to show examples of the process you’ve used to get from the initial idea to the finished piece. 4: CV. 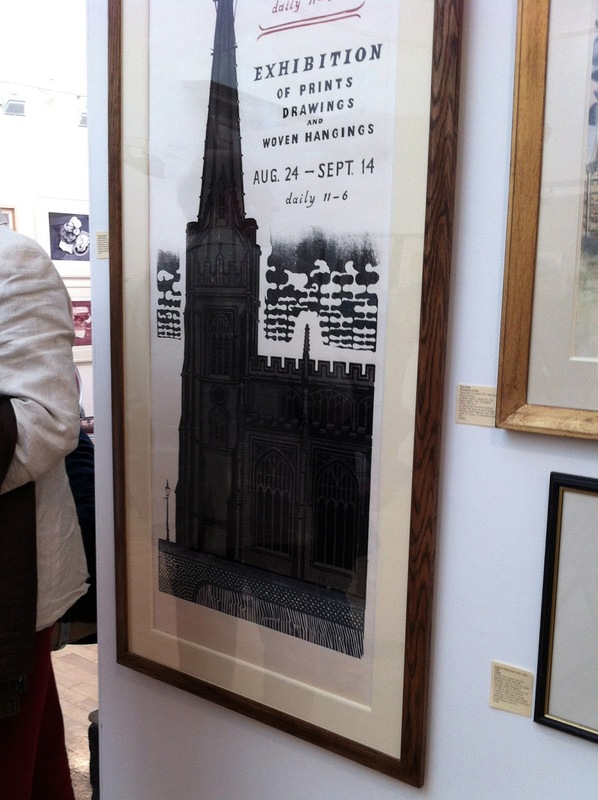 Make sure it’s up to date, relevant and preferably on one page – a good exhibiting history obviously helps but so does an interesting project, residency or commission. 5: Don’t get discouraged if you’re not successful – people sometimes get in on the first try but it’s much more usual to have several attempts. The panels who review the portfolios change all the time and what gets turned down one year may well be accepted the next. And good luck to all those willing to give it a go – fingers crossed…. Here is the usual small number of pitiful photos of the Meet the Artist session yesterday with Angie Lewin. Despite being on what felt like the hottest day in a decade, it was pretty busy – great to meet such lovely people…. Oh dear, matching tops – we must remember to consult on our wardrobes next time. 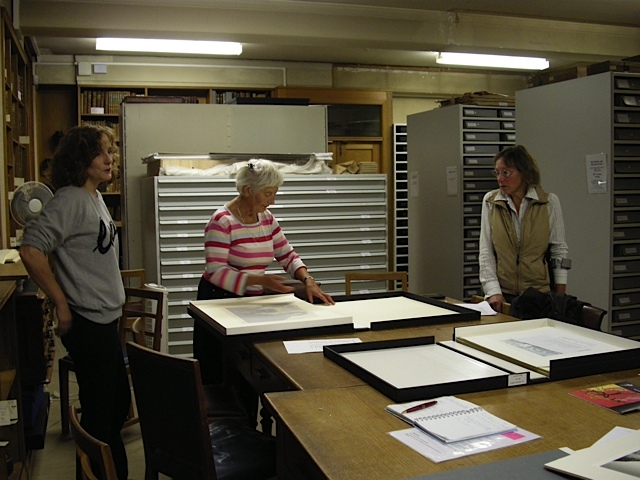 Thank goodness I made a last minute change from jeans to white trousers, otherwise it would have been really embarrassing…..
Angie discussing Brenda Hartill‘s collographs with some visitors. That’s one of life’s great pleasures, discussing another artist’s methods – how did she do that? 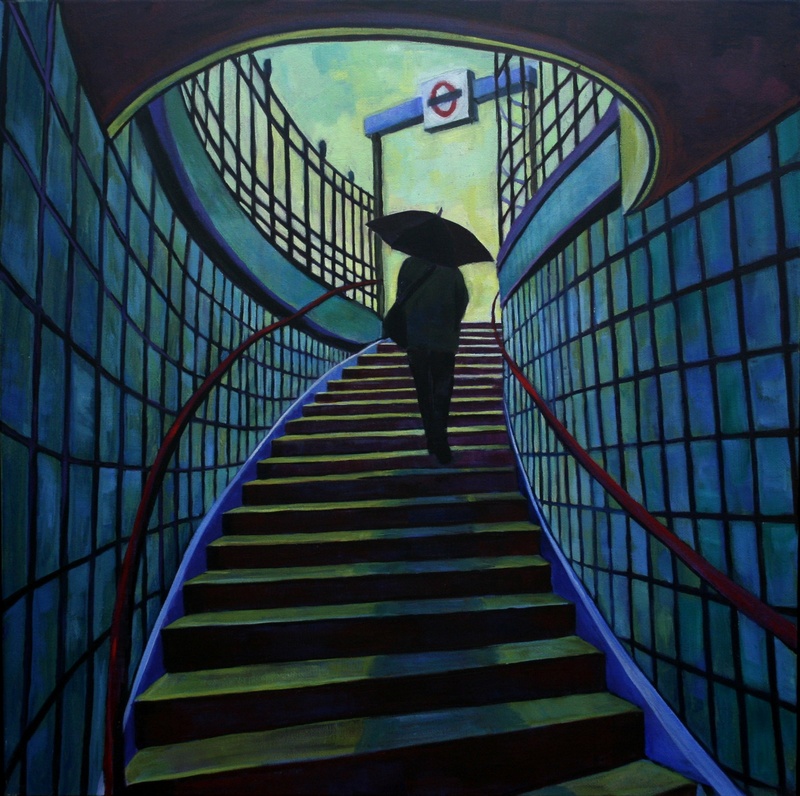 And that’s it – I’m off to the Royal Academy Summer Show for Varnishing Day soon and I really must remember to take lots of photos…. 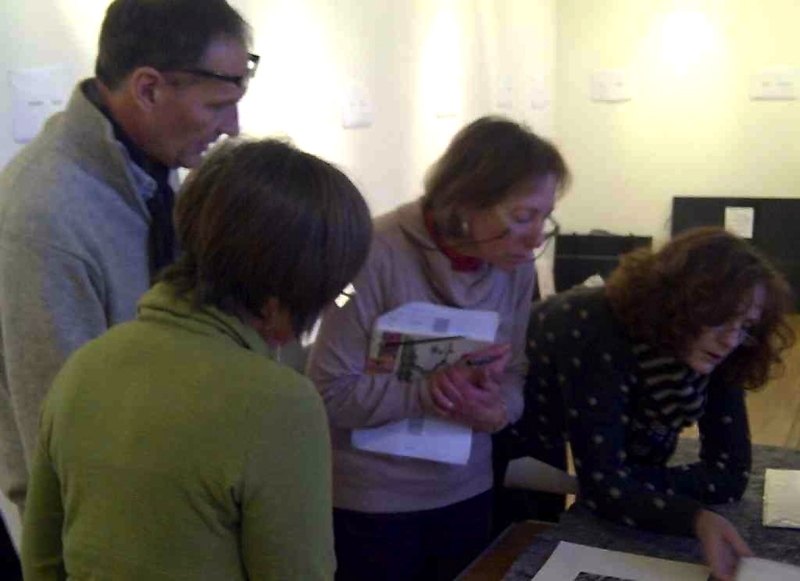 ‘Meet the Artist’ sessions are held at Bankside Gallery throughout the duration of the Annual Exhibition of the RE (Royal Society of Painter-Printmakers). Every Saturday and Sunday afternoon from 1-4, there will be an RE member present at the gallery, ready to talk about their work. Admission is free and no booking is required – just turn up. There is a complete list of artists here. I will be there this Sunday (29th May) and I’m always up for a chat about printmaking and my own work, of course. So if anyone feels like a trip up to the smoke, I’d be very happy to see you. Mostly it’s just tourists, mildly puzzled as to why I’m sitting there, and of course there’s always someone who’s come in out of the rain…. All this and some wonderful prints to see at the exhibition – well, you can’t ask for more than that, can you? I do like to be able to do both printmaking and painting – I find that one informs the other and I use both to explore a subject; to develop and refine an idea more fully. So once a painting is finished, I may use it as a starting point for a print and sometimes it’s the other way around. 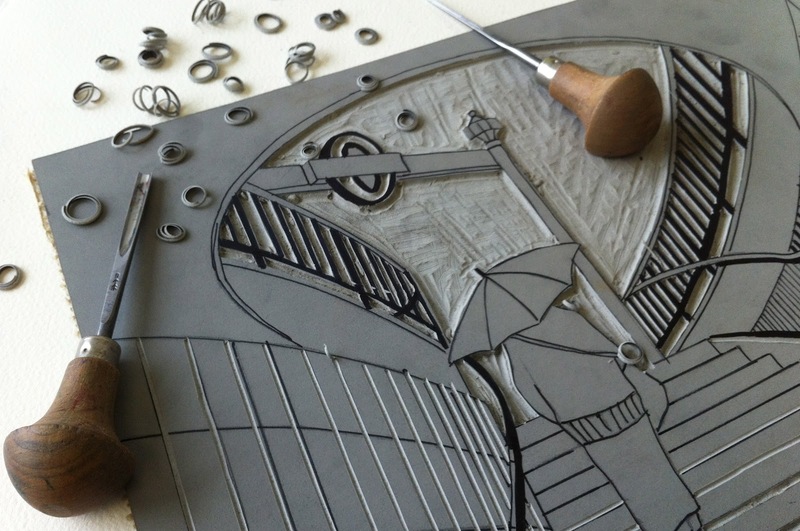 And on a practical note, printmaking is a great way of persuading a gallery to stock your work – a few of your prints in their browser is not as much a risk as giving valuable wall space to a painting. Prints are more affordable in this recession too and the artist has more work available to send out to galleries, open exhibitions, etc., and thus has more opportunities to show. So I find it enjoyable and advantageous to do both. You know those times when you’re so dispirited that you never want to see another lino block again? Well, you can just put down those cutting tools (try not to throw them out of the window) and turn once again, with a small sigh of relief, to a new white canvas. How lovely, you think, to be able to pick up a brush and enjoy the immediacy of painting (until the inevitable time comes when you never want to see another tube of oil paint again and wistfully recall the pleasures of printmaking…). So anyway, here is an oil painting of mine (Early Morning, 50x50cms), which I sold at my show ‘From the City to the Suburbs’ at Cambridge Contemporary Art last year. It’s now available as a greetings card. After quite a bit of alteration to the original working drawing and a lot of simplification, I started to cut the four blocks – the colours used, in order of printing, were raw umber, crimson, cream (olive green and a lot of white) and monastral blue (as a glaze). And here is the finished linocut, now called Up With the Larks, and due to be shown at Bankside Gallery during the RE Annual Exhibition next month…. Here are my own personal thoughts on the best way to get a portfolio application together – there are no rules and sometimes it’s just a matter of crossing your fingers and hoping for the best. 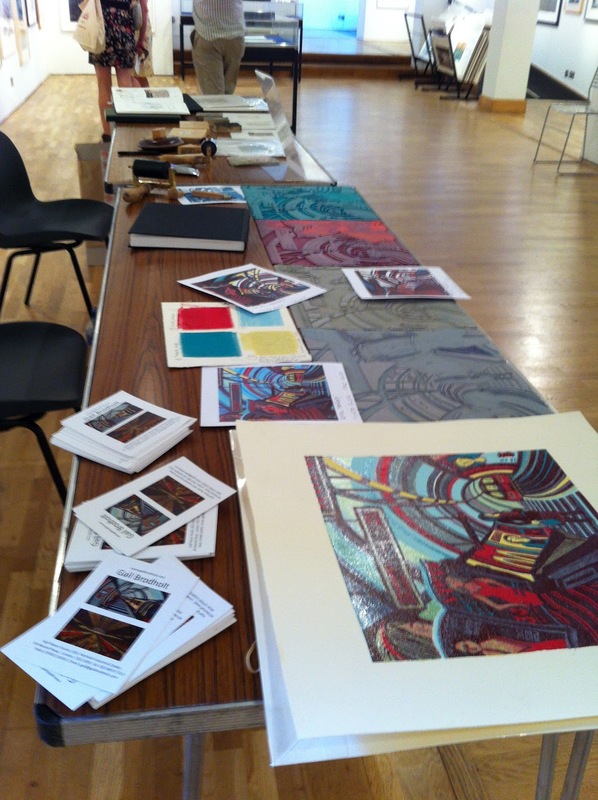 And just one more thing – all this preparation is important but at the end of the day, it’s the work that really counts…..
Every year the Royal Society of Painter Printmakers hold elections for artists who would like to become members. If you’re interested, you will need to fill out an application form (here) and return to the Bankside Gallery, London by the 27th January 2012. A week or two later, you will need to deliver a portfolio of (eight?) prints, together with a CV and some supporting material (a sketchbook, perhaps) to Bankside Gallery. It’s a great society to be a member of – you make new friends, get to exhibit in Central London three times a year and you can use the initials RE after your name, if you’re into that sort of thing. 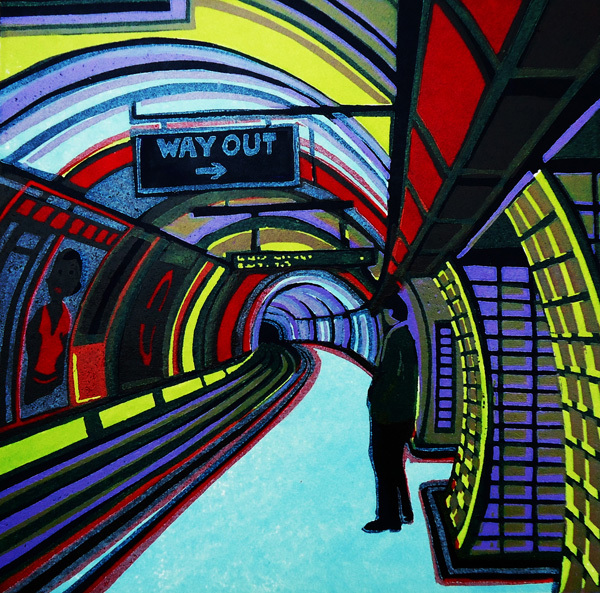 When I was elected a member of the Royal Society of Painter-Printmakers (RE) this print was chosen as my Diploma Work. 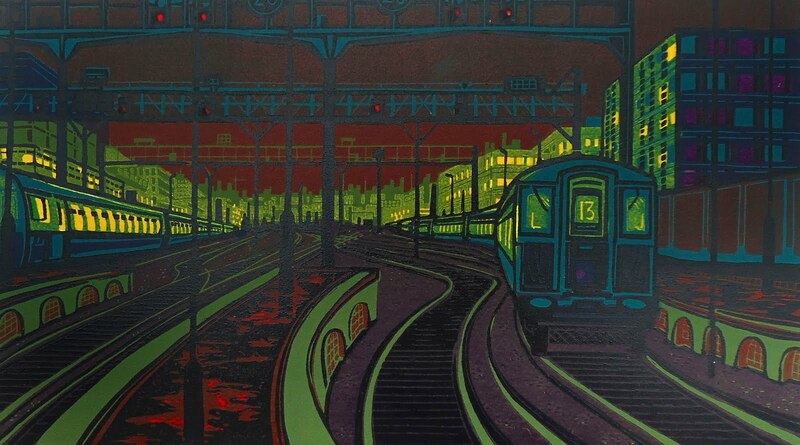 It’s called Rush Hour (linocut, 29 x 52cms.) Apologies for the quality of the image – it’s a bit dark unfortunately. 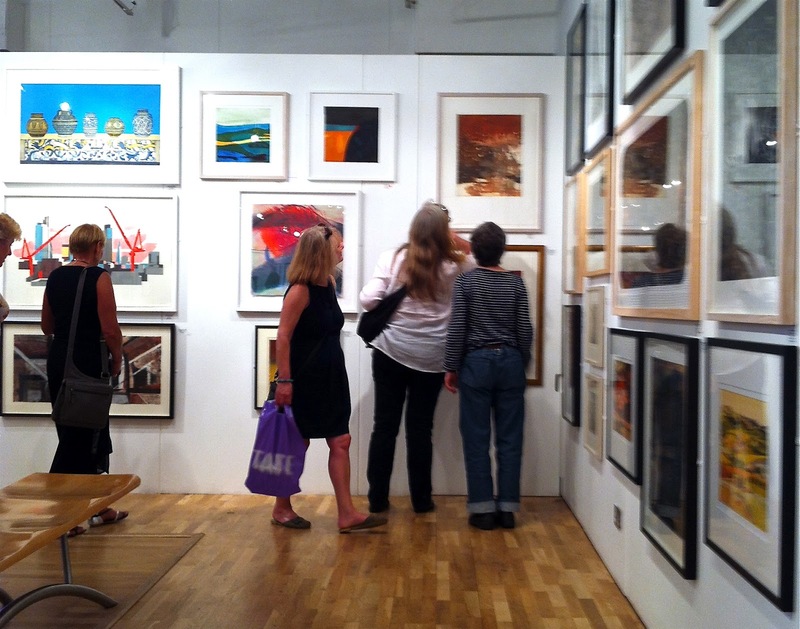 The RE holds annual elections at Bankside Gallery, London, for artists who would like to join the Society and enjoy the benefits of being a member. Candidates are asked submit a completed application form plus CV and portfolio of prints and drawings/sketchbooks, usually in January each year. Applicants’ works are assessed by a jury of Society members and usually between 3 and 6 artists are elected from some 40-50 submissions each year. 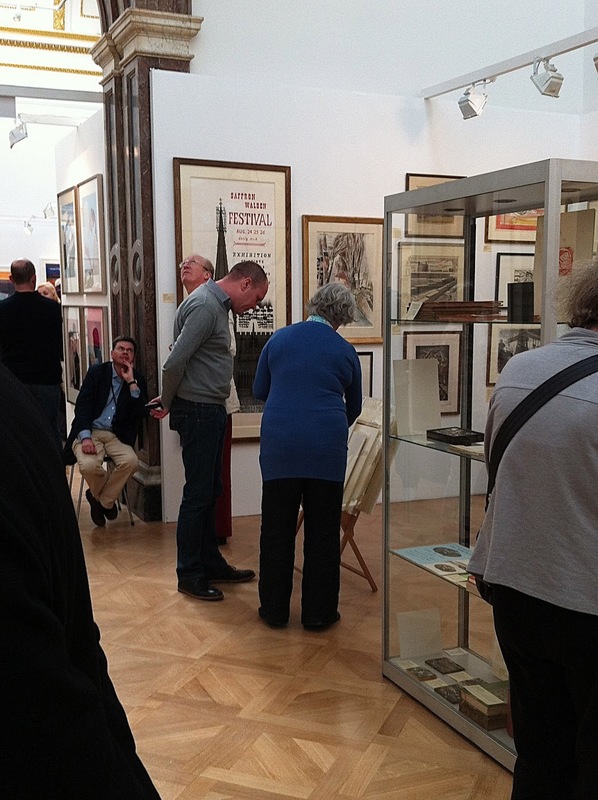 Elected members must pay an annual fee, which helps to cover gallery costs. If you are interested in applying, you can download the application form here . On Wednesday, I had a rare day away from the studio. I went up on the train to Oxford to visit the Print Room at the Ashmolean Museum, where the RE Diploma Collection is held. There I met up with Bren Unwin and Daphne Casdagli, respectively President and Curator of the Royal Society of Painter-Printmakers. 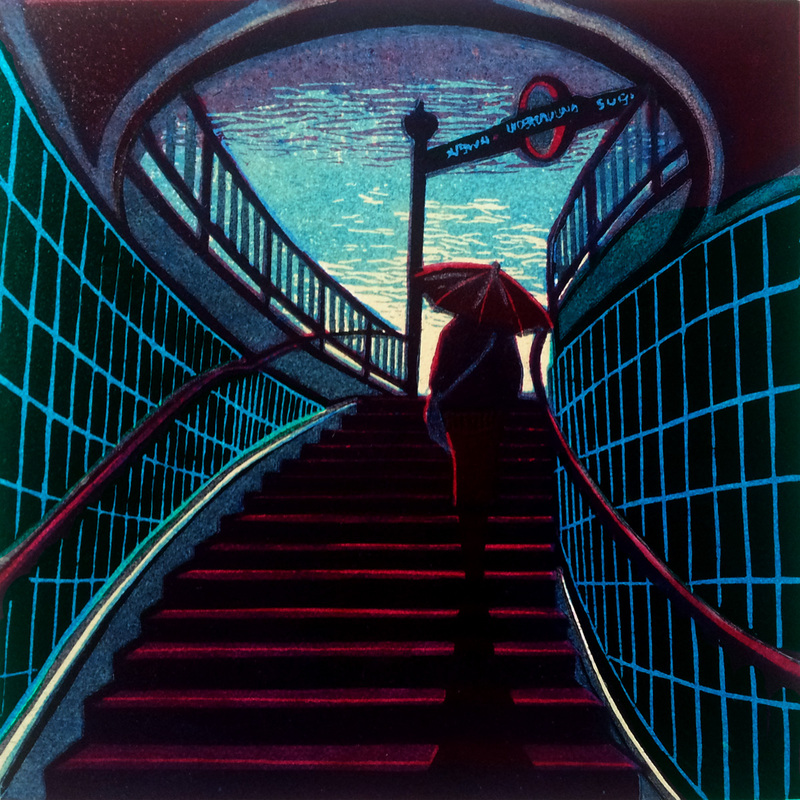 When an artist is elected to the Society of Painter-Printmakers (RE), a print is selected from their portfolio by the council and delivered to the RE archives, held at the Ashmolean. We were there to meet Clare Tilbury, Hon RE and art historian, who manages the diploma collection on our behalf, and to hand over the prints from our newly elected Associate Members. 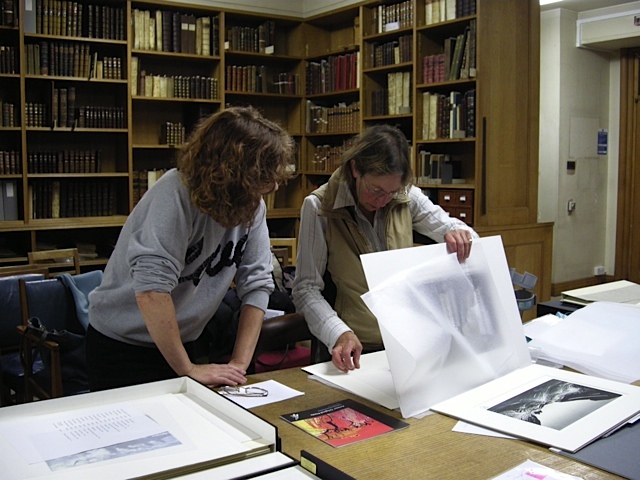 Left: Myself and Daphne Casdagli (right) unpacking the prints. The Diploma Collection is a substantial historic collection of prints, dating back to the earliest days of the Society and includes work by distinguished past and present members, such as Dame Laura Knight, Graham Sutherland and Norman Ackroyd. 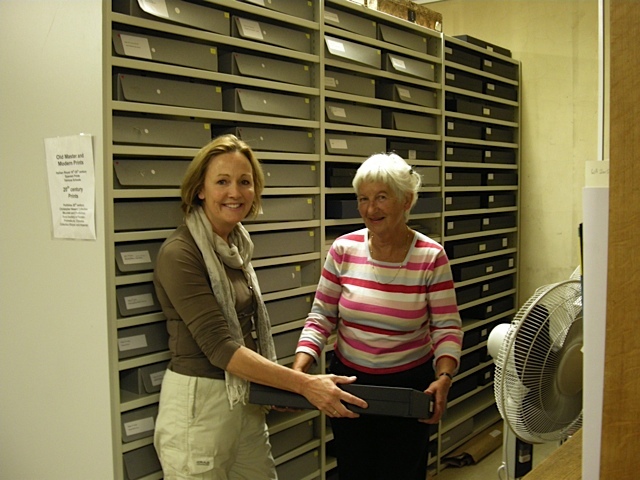 Left: Bren Unwin (left) and Clare Tilbury (right) taking out the relevant storage boxes. 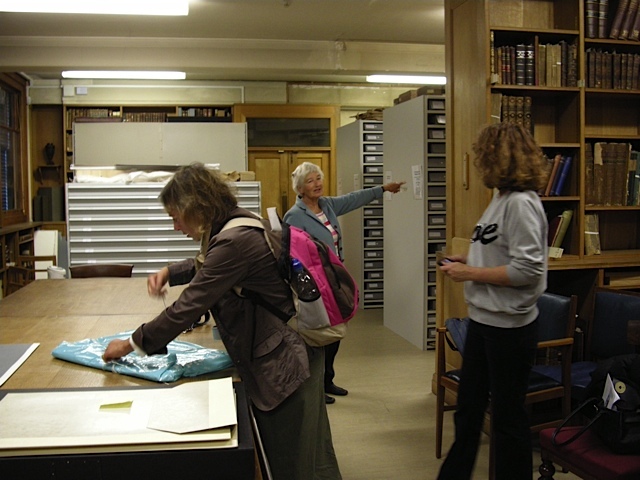 There are over nine hundred prints carefully catalogued and stored here, as the Society has been going since 1881. The collection can be viewed on request to the museum. And just in case anyone’s wondering what exactly I was doing there, I was shadowing Daphne as I am due to take over from her as Curator for the RE next year.